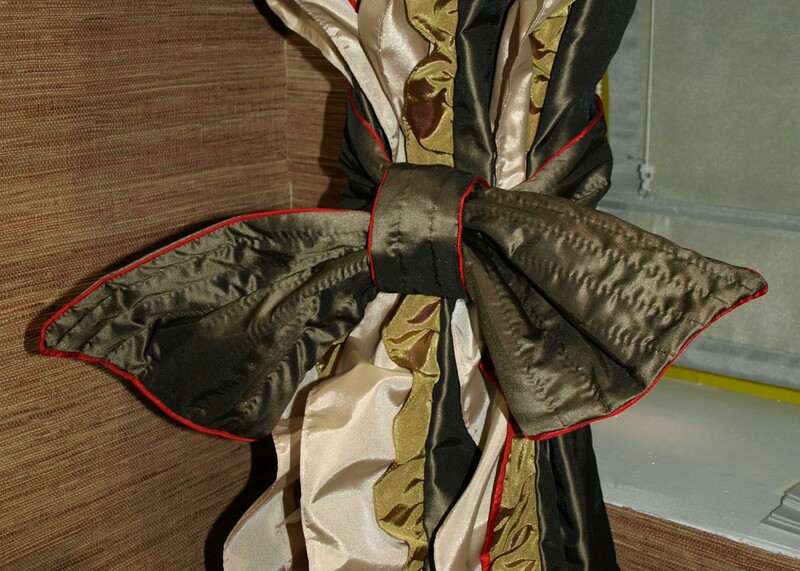 Posted by Tammi in Couture Elements, Workroom Angle - How did they do that? 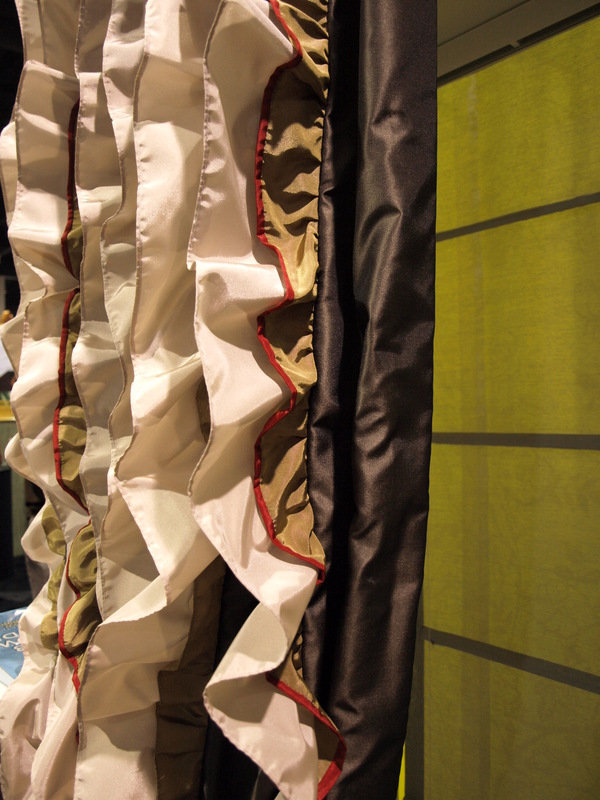 This gorgeous window treatment that I made for the 2008 IWCE Trendspot in Atlanta was one of the most laborious to date in my career. Hence the title of this post as being in LABOR! I call them my “Grace” panels and I’ll tell you why at the end. But what a sight to behold huh? When I was presented with the opportunity from Deb Barrett (www.debbarrett.com) of Window Dressings and the Trendspotter for Vision Magazine, to fabricate this for the show, my heart leapt because it was such an explosion of couture elements. Elements near and dear to my heart. Very easy to make but just very time consuming. The design was based on what she had seen at the recent Maison et Objet show in Paris but we tweaked it just a bit to make it our own. What I love about Deb is that she really gives credence to her workroom’s ideas and suggestions. She is a very creative gal and we both like “over the top”. We had 3 fabrics to work with, all from Maxwell Fabrics Inc. and a nice handed polyester, just different colors and not all the same yardage. She knew she wanted the brown to be the base of the panel. She let it up to me to decide which color would look best and where. I loved the idea of doing a tiny band in red on the edge of the bronze ruffle to match the tiny red microcord she wanted around the tieback edge. Let’s get down and dirty now: Here are the specifics: The panel length is 84″ lined and interlined. There are 6 ruffles between 7 panels of brown. 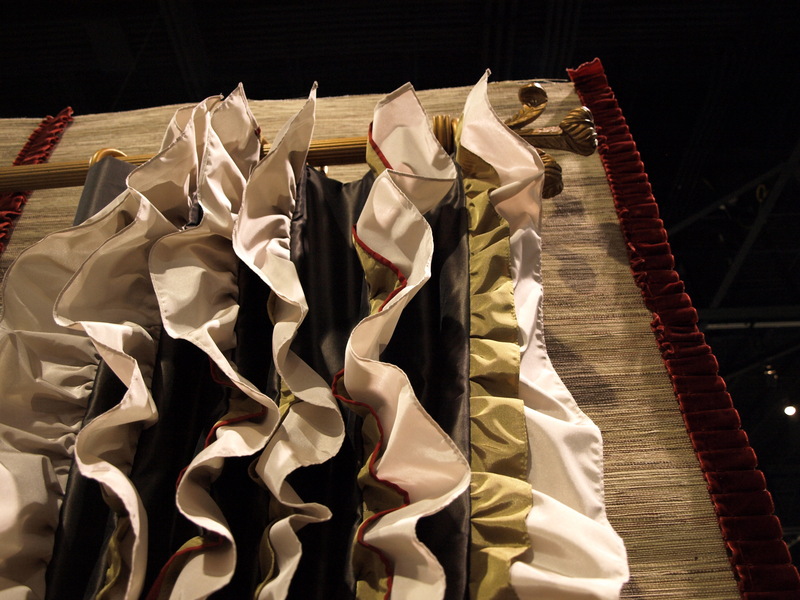 The ruffles alternate with the red banding and without on the panel, starting with red on the leading edge and fanning back toward the return. 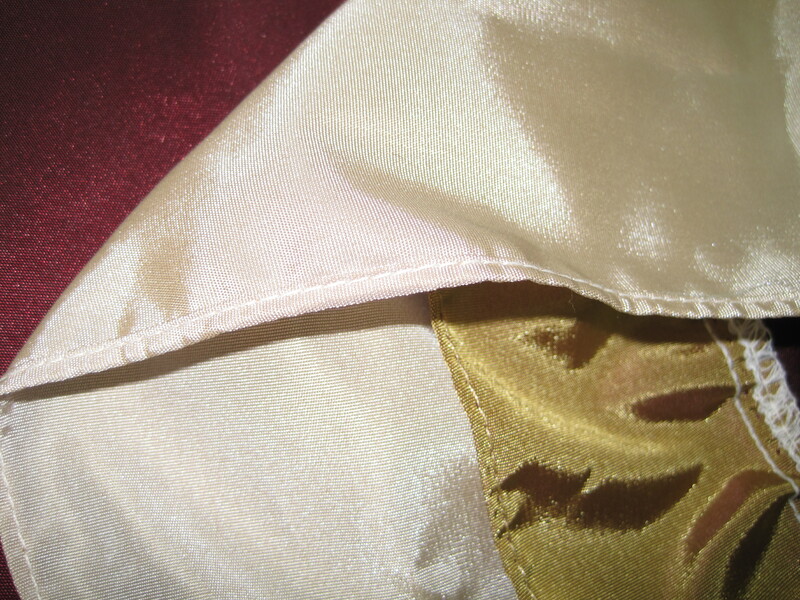 The light tan fabric is a 5″ cut width x 56 yards. YES, 56 yards to ruffle. But wait, it gets better. The bronze is a 2 1/2″ cut width x 56 yards and then the red is a 3/4″ cut width by 28 yds. Cutting was just as laborious! The first thing I did was to hem the tan and bronze without the red banding using a narrow rolled hem foot used in dressmaking. It is a nice clean look from the opposite side as it would be noticeable when you looked at the panel. This panel had to look good from all sides! On the bronze piece with the red band, I simply serged the red to the bronze and folded it over the edge, wrapping it around and stitching in the ditch to hold it down. Then I layed the bronze on top of the tan and serged the two layers together. Once that was done, I was ready to ruffle the pieces using a ruffler attachment on my machine. That being done, I set them aside and then cut my brown fabric into 7 strips. Keep in mind when you do this, that you need to allow extra width for the return and leading edges because they also have 2″ double fold side hems. The middle 5 sections are exactly the same cut width. Starting 8″ down from top and ending 10″ up from bottom, sandwich the ruffles between the brown sections and stitch together. Press all seams! Please note that you will have to add for shrinkage in length due to the gathering. I lost 2″ in length when all sections were sewn together, so my cut length was based on extra for shrinkage. When you have a complete panel, lay it face side down and lay the interlining on wrong side 10″ up from bottom edge. Now lay lining right side up 10″ up from bottom edge. 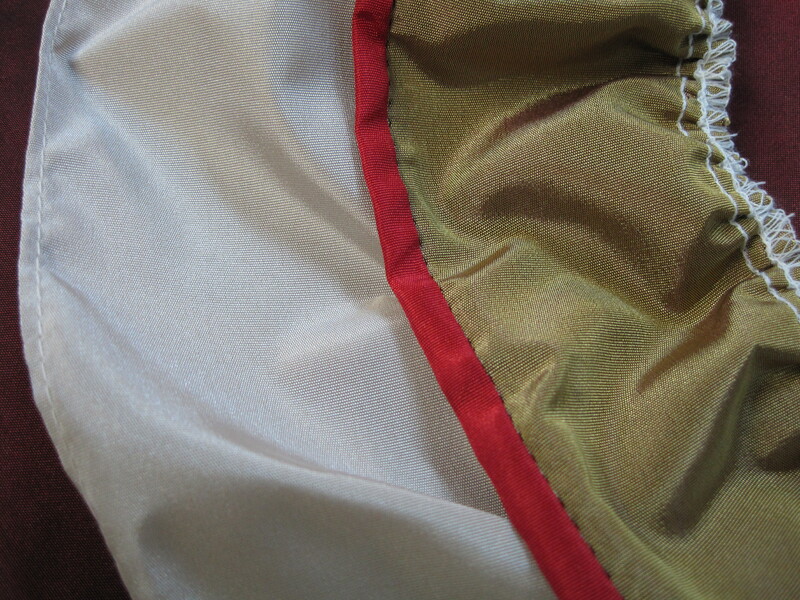 Turn the bottom up for 5″ dbl fold hem and hand sew in place. Do the same with the side hems, using a 2″ dbl fold hem and as you hand sew, catch the front side every 6 inches lightly to keep in place. Do the same with the top edge turning under 4″ dbl fold and hand sew in place. When panel is finished, now you want to take the top edge and at every seam with a ruffle, turn wrong sides together and stitch down 1″ and over 1″ to form fold to insert pin. Or, you can hand sew rings at the back of each ruffle. Don’t you just want to run your fingers through these ruffles? Now for the tieback: Cut 2 long sections of brown and taper them at each end. Make your red micro cord and sew onto top brown section. Cut 2 pieces of flannel interlining and lay on bottom piece. Sew right sides together including interlining , leaving an opening to turn inside out. Turn inside out, press and sew the opening closed. To get that quilted look, sew seams 1″ apart throughout length of tieback. To make the knot, cut a 4″ piece in width by 8″ length and construct the same way you did tieback. Sew ends together to form a roll. This is what the tieback is placed through and holds it all together. WHEW! Are you ready to give birth to something gorgeous now? I hope you have been inspired because it really is easy, it’s just time consuming. Just imagine all the possibilities with fabrics and colors too! Oh, the reason I call these the “Grace” panels are because Grace McNamara liked these so much, she is now the proud owner of them! You know, from a designer’s perspective, labor-intensive panels like these make really good business sense. Several times over the past couple of years I’ve had clients price-shop high-end fabrics I’ve shown them on the internet (even though Lee Jofa, Beacon Hill, etc are not allowed to be sold that way, they still pop up from time to time). But if I design treatments like this one that combine reasonably-priced fabrics with labor-intensive, couture sewing, there’s really nothing for the client to price shop. What’s more, the client is getting something truly unique and special — you haven’t just sewn drapery panels here, you’ve created a custom, one-of-a-kind fabric, and I love the possibilities for selecting ruffle and base fabrics to get the exact color mix I need for a project. I”m in awe, these are just beautiful. I can handle ruffles coming back if they look like this. You must be a proud parent ! Yes Tammy, I am a proud parent! Rebecca, the possibilities are endless because of the combination of colors that you can use. I also envision these in the aquatic colors to mimic the Carribean or Spa environment. OOHH, I am so inspired right now! See, we can even change the flow of a room with these panels too! Happy creating and finding that workroom that is willing to put all the love and passion into this treatment is priceless! I’m THAT workroom! As my mother would say ” a woman after my own heart”. I’ll bet every fabric talks to you.